I tend to go through phases with cookbooks and it had been a while since I had last dallied with Veganomicon. As anyone who read the pig’s head post knows, I am far from being a vegan but this cookbook has some great recipes and I love their quinoa salad, stir fried greens, cauliflower hummus and jicama salad. In my current mode of trying to use up hoarded food I picked up Veganomicon looking for a beet recipe and found a winner. This beet and parsnip salad was the perfect for brighting up a gray winter day and packing yourself with vitamins. 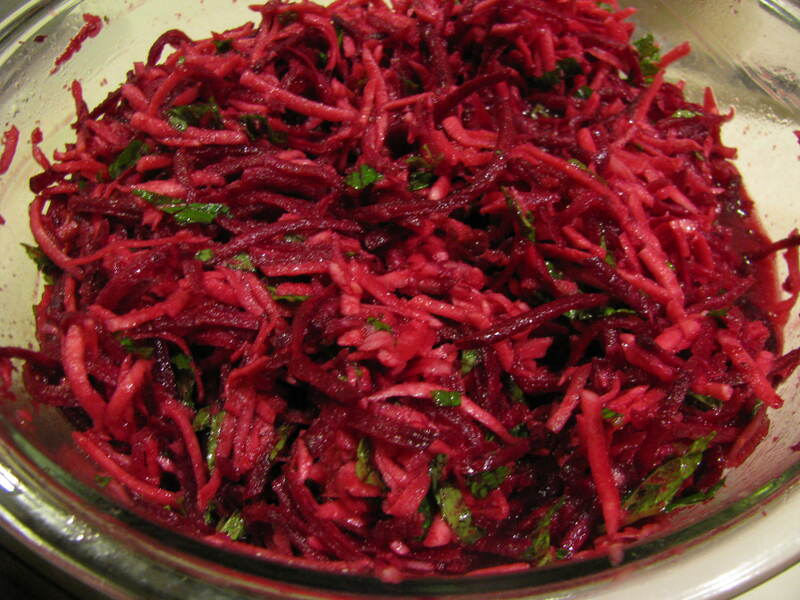 It is made with equal quantities of shredded parsnip and beet – raw, a handful of coarsely chopped fresh mint and a dressing made with pineapple juice, oil, vinegar, garlic, salt and maple syrup. I thought that the dressing in book used too much liquid (2 cups of pineapple juice) so when I make it again I will reduce the amount of juice. The salad ended up sitting in a lot of liquid. When I went to the grocery store looking for pineapple juice I was amazed to see that the ‘fresh’ version was made from concentrated juice from 5 countries, spread across 3 continents. It didn’t seem worth paying three-times the price of frozen concentrate, which is what I used. Next time I will buy a can of pineapple in juice, eat the pineapple and use the juice from the can. The ideal would be juice from a fresh pineapple – just I don’t have a juicer. 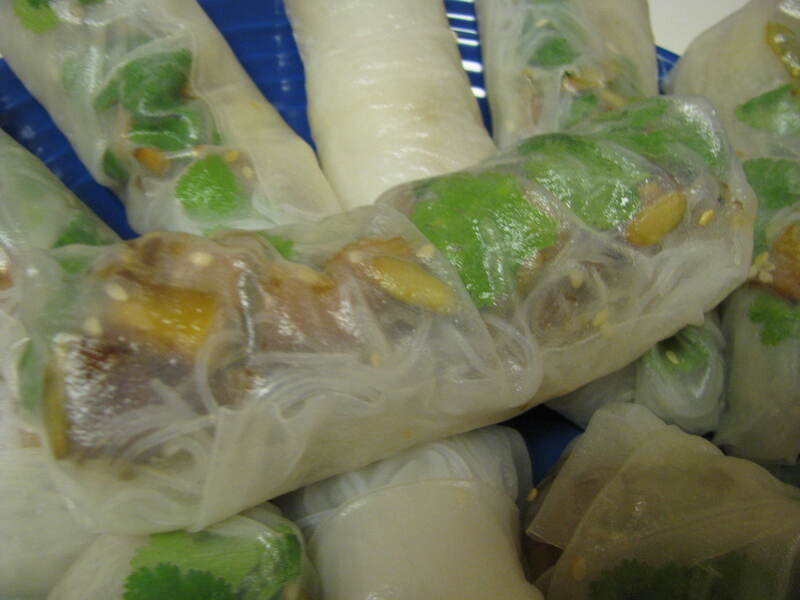 I also made Veganomicon’s butternut squash and pumpkin seed rice paper rolls. I have made these before but this time, I improved the recipe by marinating the squash cubes and roasting them with sesame seeds. 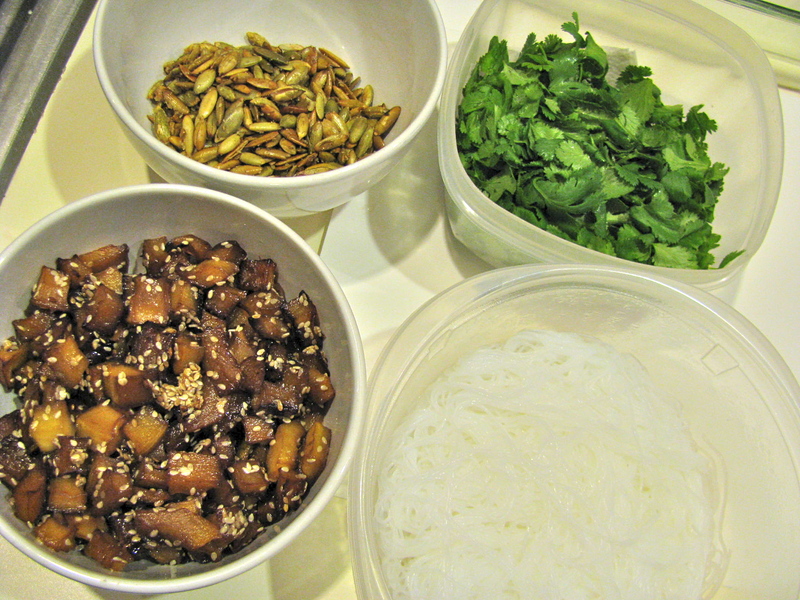 The marinade was the same as the squash cubes that I made for New Year’s Eve, with soy sauce, sesame oil and honey. The caramelized cubes added more flavor to the rolls and complemented the dipping sauce.